At that time, two of them were going to a village named Emmaus, about seven miles from Jerusalem, and talking with each other about all these things that had happened. While they were talking and discussing together, Jesus himself drew near and went with them. But their eyes were kept from recognizing him. And he said to them, "What is this conversation which you are holding with each other as you walk?" And they stood still looking sad. Then one of them, named Cleopas, answered him, "Are you the only visitor to Jerusalem who does not know the things that have happened there in these days?" And he said to them, "What things?" And they said to him, "Concerning Jesus of Nazareth, who was a prophet mighty in deed and word before God and all the people, and how our chief priests and rulers delivered him up to be condemned to death, and crucified him. But we had hoped that he was the one to redeem Israel. Yes, and besides all this, it is now the third day since this happened. Moreover, some women of our company amazed us. They were at the tomb early in the morning and did not find his body; and they came back saying that they had even seen a vision of angels, who said that he was alive. Some of those who were with us went to the tomb, and found it just as the women had said; but him they did not see." And he said to them, "O foolish men, and slow of heart to believe all that the prophets have spoken! Was it not necessary that the Christ should suffer these things and enter into his glory?" And beginning with Moses and all the prophets, he interpreted to them in all the scriptures the things concerning himself. So they drew near to the village to which they were going. He appeared to be going further, but they constrained him, saying, "Stay with us, for it is toward evening and the day is now far spent." So he went in to stay with them. When he was at table with them, he took the bread and blessed, and broke it, and gave it to them. And their eyes were opened and they recognized him; and he vanished out of their sight. They said to each other, "Did not our hearts burn within us while he talked to us on the road, while he opened to us the scriptures?" And they rose that same hour and returned to Jerusalem; and they found the eleven gathered together and those who were with them, who said, "The Lord has risen indeed, and has appeared to Simon!" Then they told what had happened on the road, and how he was known to them in the breaking of the bread. Prokeimenon. Plagal First Tone. Psalm 11.7,1. You, O Lord, shall keep us and preserve us. Verse: Save me, O Lord, for the godly man has failed. The reading is from St. Paul's Second Letter to Timothy 3:10-15. TIMOTHY, my son, you have observed my teaching, my conduct, my aim in life, my faith, my patience, my love, my steadfastness, my persecutions, my sufferings, what befell me at Antioch, at lconion, and at Lystra, what persecutions I endured; yet from them all the Lord rescued me. Indeed all who desire to live a godly life in Christ Jesus will be persecuted, while evil men and impostors will go on from bad to worse, deceivers and deceived. But as for you, continue in what you have learned and have firmly believed, knowing from whom you learned it and how from childhood you have been acquainted with the sacred writings which are able to instruct you for salvation through faith in Christ Jesus. Our Father among the Saints Hermogenes (Germogen), Patriarch of Moscow, was born about 1530 in Kazan. While yet a layman, he lived as a clerk in the Monastery of the Transfiguration in Kazan. In 1569, the year that Metropolitan Philip of Moscow was slain in Tver (see Jan. 9), Saint Barsanuphius, Bishop of Tver, fled to Kazan fearing the wrath of Ivan the Terrible. So Hermogenes became a spiritual son of Saint Barsanuphius. He was made priest of the Church of Saint Nicholas in Kazan, and was a witness of the miracles of the newly-appeared icon of our Lady of Kazan (see July 8). Later he became Abbot of the Monastery of the Transfiguration, and in 1589 was consecrated Metropolitan of Kazan, in which capacity he converted and baptized many pagan Tartars and heterodox. In late 1604, the so-called false Dimitry, a pretender to the Russian throne who claimed to be the son of Ivan the Terrible (who had died in 1584), crossed the Russian border, having the support of the Jesuits and King Sigismund III of Poland, who hoped through Dimitry to force Papism upon the Russian people; a few cities, such as Chernigov, soon surrendered to him. Shaken by these calamities, Tsar Boris Gudonov died suddenly, and in June, 1605, the pretender entered Moscow and took the Russian throne. He then declared his intention to marry a Polish woman without her receiving Baptism in the Orthodox Church; when the authorities and the hierarchy remained silent out of fear, it was Metropolitan Hermogenes alone who fearlessly rebuked him and demanded that she renounce Papism and be baptized according to the rites of Orthodoxy. For this, Hermogenes was banished to Kazan. In 1606 Prince Basil Shuisky led the people in the overthrow of Dimitry, and Basil was elected Tsar in Moscow; Hermogenes was made Patriarch of Moscow. The overthrow of Dimitry did not end the endeavours of the Poles to subject Russia to themselves, and in those times of upheavals, treachery, and bloodshed, the valiant Patriarch Hermogenes showed himself to be a great spiritual leader of the people, and, like Saint Philip of Moscow almost half a century before, the conscience of Orthodox Russia in times of betrayal and terror. In 1609 King Sigismund succeeded in setting his son upon the Russian throne, and Patriarch Hermogenes again insisted that the new Tsar be baptized in the Orthodox Church, marry an Orthodox Christian, and have no dealings with the Pope. The Poles, together with rebel boyars who supported them, imprisoned Patriarch Hermogenes in an underground chamber of the Chudov Monastery during Holy Week of 1611, where they slowly starved him to death; he gave up his holy soul on February 17, 1612. In 1653, his holy relics were found incorrupt; in 1812, when Napoleon captured Moscow, the Saint's tomb was desecrated in the search for treasure; when the French withdrew, the Patriarch's holy body was found intact on the floor of the cathedral; in 1883 his holy relics were again found whole. Saint Hermogenes was glorified on May 12, 1913, and added to the choir of holy hierarchs of Moscow, whose feast is celebrated on October 5; at the time of his glorification a multitude of miracles were wrought through his incorrupt relics. According to some, this Saint was born in Rome, but according to others in Tyrrenia (Tuscany), and was consecrated to the archiepiscopal throne of Rome in 440. In 448, when Saint Flavian, Archbishop of Constantinople, summoned Eutyches, an archimandrite in Constantinople, to give account for his teaching that there was only one nature in Christ after the Incarnation, Eutyches appealed to Saint Leo in Rome. After Saint Leo had carefully examined Eutyches's teachings, he wrote an epistle to Saint Flavian, setting forth the Orthodox teaching of the person of Christ, and His two natures, and also counseling Flavian that, should Eutyches sincerely repent of his error, he should be received back with all good will. At the Council held in Ephesus in 449, which was presided over by Dioscorus, Patriarch of Alexandria (and which Saint Leo, in a letter to the holy Empress Pulcheria in 451, was the first to call "The Robber Council"), Dioscorus, having military might behind him, did not allow Saint Leo's epistle to Flavian to be read, although repeatedly asked to do so; even before the Robber Council was held, Dioscorus had uncanonically received the unrepentant Eutyches back into communion. Because Saint Leo had many cares in Rome owing to the wars of Attila the Hun and other barbarians, in 451 he sent four delegates to the Fourth Ecumenical Council, where 630 Fathers gathered in Chalcedon during the reign of Marcian, to condemn the teachings of Eutyches and those who supported him. Saint Leo's epistle to Flavian was read at the Fourth Council, and was confirmed by the Holy Fathers as the Orthodox teaching on the incarnate person of our Lord; it is also called the "Tome of Leo." The Saint wrote many works in Latin; he reposed in 461. See also Saint Anatolius, July 3. Philemon, who was from Colossae, a city of Phrygia, was a man both wealthy and noble; Apphia was his wife. Archippus became Bishop of the Church in Colossae. All three were disciples of the Apostle Paul. Onesimus, who was formerly an unbeliever and slave of Philemon, stole certain of his vessels and fled to Rome. However, on finding him there, the Apostle Paul guided him onto the path of virtue and the knowledge of the truth, and sent him back to his master Philemon, to whom he wrote an epistle (this is one of the fourteen epistles of Saint Paul). In this epistle, Paul commended Onesimus to his master and reconciled the two. Onesimus was later made a bishop; in Greece he is honoured as the patron Saint of the imprisoned. All these Saints received their end by martyrdom, when they were stoned to death by the idolaters. Saint Onesimus is also commemorated on February 15. This apostolic and prophetic man, and model of faith and truth, was a disciple of John the Evangelist, successor of Bucolus (Feb. 6), and teacher of Irenaeus (Aug. 23). He was an old man and full of days when the fifth persecution was raised against the Christians under Marcus Aurelius. When his pursuers, sent by the ruler, found Polycarp, he commanded that they be given something to eat and drink, then asked them to give him an hour to pray; he stood and prayed, full of grace, for two hours, so that his captors repented that they had come against so venerable a man. He was brought by the Proconsul of Smyrna into the stadium and was commanded, "Swear by the fortune of Caesar; repent, and say, 'Away with the atheists.'" By atheists, the Proconsul meant the Christians. But Polycarp, gazing at the heathen in the stadium, waved his hand towards them and said, "Away with the atheists." When the Proconsul urged him to blaspheme against Christ, he said: "I have been serving Christ for eighty-six years, and He has wronged me in nothing; how can I blaspheme my King Who has saved me?" But the tyrant became enraged at these words and commanded that he be cast into the fire, and thus he gloriously expired about the year 163. As Eusebius says, "Polycarp everywhere taught what he had also learned from the Apostles, which also the Church has handed down; and this alone is true" (Eccl. Hist., Book IV, ch. 14,15). It is possible for those who have come back again after repentance to shine with much lustre, and oftentimes more than those who have never fallen at all, I have demonstrated from the divine writings. Thus at least both the publicans and the harlots inherit the kingdom of Heaven, thus many of the last are placed before the first. When lately we made mention of the Pharisee and the publican, and hypothetically yoked two chariots out of virtue and vice; we pointed out each truth, how great is the gain of humbleness of mind, and how great the damage of pride. The Publican fasted not; and yet he was accepted in preference to him who had fasted; in order that thou mayest learn that fasting is unprofitable, except all other duties follow with it. For the nature of a fast is such, that it does not suffice to deliver those who practise it, unless it be done according to a suitable law. "For the wrestler," it is said, "is not crowned unless he strive lawfully." Our sister parish in Loudoun County is seeking volunteers to help with their biggest fund-raiser of the year. 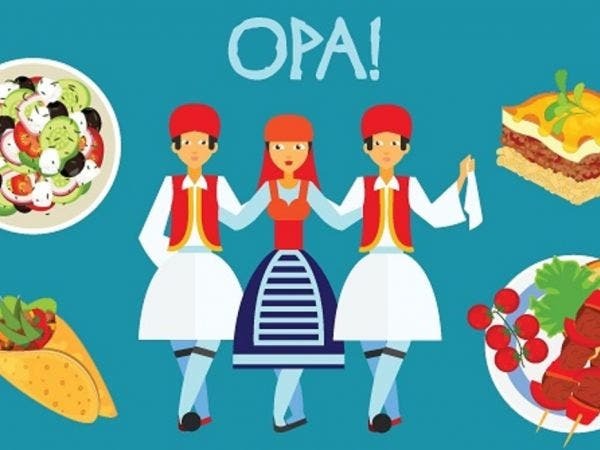 Come Celebrate a Taste of Greece! Authentic Greek Food and Pastries, Dancing and more. You will need to create an account with Sign Up Genius, which simply is entering an email address. Thanks for helping our sister parish. Many of their parishioners came and worked long hours and days at our Festival last August. They really helped us out a great deal. Let's support them with their biggest event of the year. The Ladies Philoptochos General Members Meeting has been rescheduled to Saturday, February 16th at 10:30 at the church social hall.